It’s always interesting to see which stocks are up when the market as a whole is down. Sometimes, it can tip you off to action in sectors or industries you may have been overlooking. 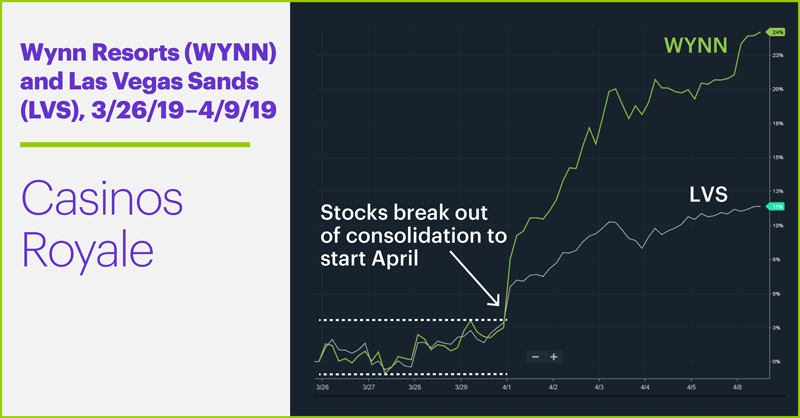 WYNN was up more than 2.5% at the time, perhaps getting an extra boost from an analyst upgrade on a morning that featured a rash of high-profile downgrades.1 The stock has rallied more than 20% since breaking out of a consolidation on April 1, and LVS is up more than 10% since then. Both LVS and WYNN took their lumps with the rest of the market in 2018; the chart above shows WYNN was more than cut in half (from around $202 to $90) between May and December last year, a sell-off that may have been exacerbated by sexual harassment charges leveled at former chairman Steve Wynn, who is no longer with the company. Oversold? After testing its October lows in late December, the stock has rallied more than 50%. That’s hot. 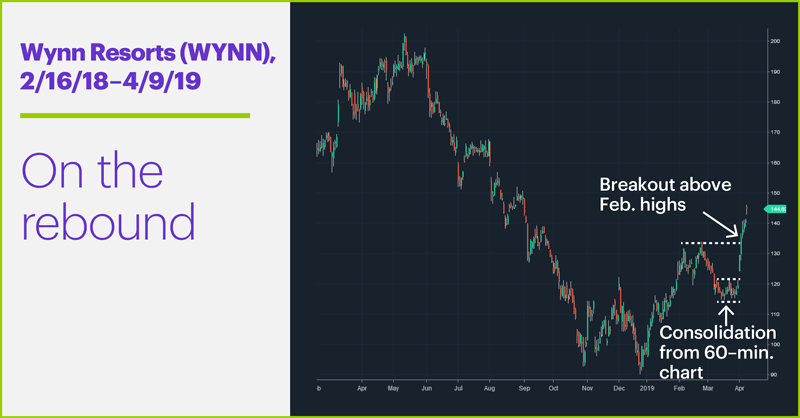 Which is why experienced traders may be looking for pullback opportunities to catch potential WYNN upside, and keeping an eye on the company’s next earnings release, currently scheduled for April 24 (two weeks from Wednesday). Today’s numbers (all times ET): NFIB Small Business Optimism Index (6 a.m.), JOLTS (10 a.m.). Today’s earnings include: Shaw Comms (SJR), PriceSmart (PSMT), WD-40 (WDFC). 1 CNBC.com. There were a ton of big analyst calls about major stocks on Monday. Here are the highlights. 4/8/9. 2 TheFly.com. Morgan Stanley raises Macau casino operator targets on higher mass forecast. 3/6/19. 3 Barron’s. Wynn Resorts Stock Is on a Tear. This Analyst Expects More Gains. 4/8/19. 4 Investor’s Business Daily. Stocks Edge Lower; Boeing Weighs On Dow Jones, Snap Stock Soars. 4/8/19. 5 Bloomberg. China Is on a Big Gold-Buying Spree. 4/8/19. An oil stock diverges from crude, while a social media titan makes a break for it.